Razer made a splash in the market with the launch of the Razer Phone towards the end of last year. The device was built for gamers, and it featured a stunning 120Hz display, Dual-front firing speakers and some top of the line specs. Now, the company has launched a new “Limited Edition” variant of the smartphone. 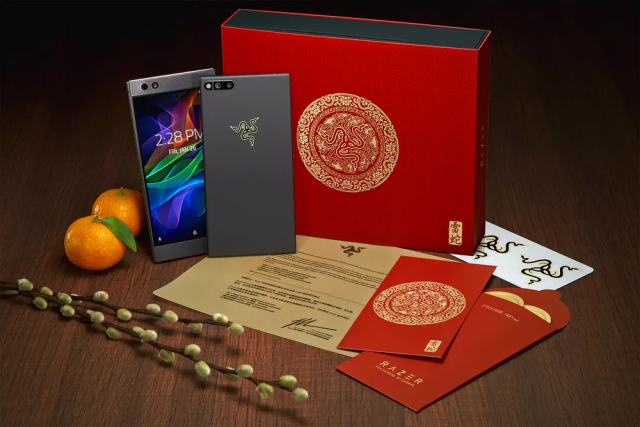 Razer is celebrating the Chinese New Year a.k.a the Spring festival, with the launch of a new Limited Gold Edition Razer phone. The Razer Phone 2018 Gold Edition comes in a special red-sleeved box which looks aesthetically pleasing. Once you get past that, we’re looking at just a cosmetic change. The Razer logo at the back of the phone is dyed in Gold. Apart from the exclusive gold-tinted Razer logo and matching stickers to go with it, there’s nothing special about this Limited Edition of the smartphone. As mentioned earlier, this particular Gold Edition will be sold in the US and in Hong Kong to celebrate the 2018 Chinese Spring Festival. That being said, there’s not a lot to complain about this device. Especially, considering the fact that the price of the Razer Phone Gold Edition is the same as the standard version at $699.99, we can’t expect a lot of goodies. There’s no word from Razer on how “limited” this variant actually is and how many of these are they making. However, if you’re interested in getting your hands on one of these, then it might be best to jump into the bandwagon early. Razer has been quite consistent when it comes to pushing updates to this smartphone and making it better. The Razer Phone’s camera, which was its weakest link when it came out, has now gotten a lot better with updates. In fact, the company recently pushed a firmware update which brings support for Netflix HDR, Dolby Audio, etc.